Award-winning, Waterbury-based photographer Peter Miller has been taking pictures of Vermonters since he bought his first camera as a teenager in Weston. 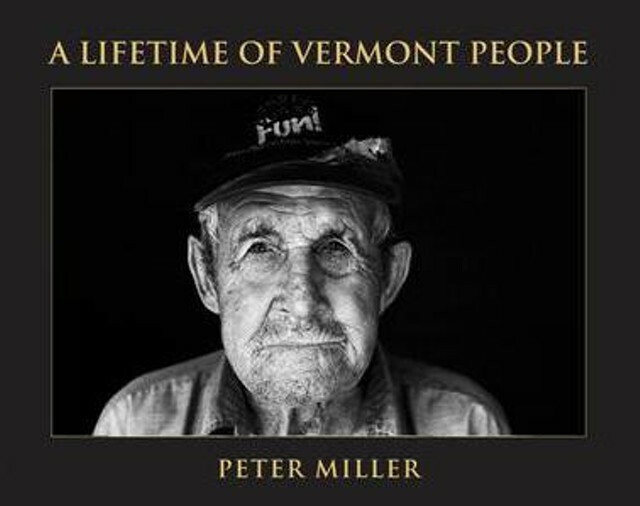 Last year, he published A Lifetime of Vermont People, a gorgeous, 208-page, 9-by-12-inch coffee-table book with 60 black-and-white portraits culled from 63 years of his work. The images are accompanied by wonderfully wry and evocative essays penned by Miller. A Lifetime of Vermont People was just named the best New England photo and art book by the New England Society in the City of New York (which, in case you were wondering, is "one of the oldest social and charitable organizations in the United States," founded in 1805 to promote "friendship, charity and mutual assistance among and on behalf of New Englanders living in New York," according to its website). "It's quite a surprise," says Miller, reached by phone on Monday, noting that his work had been in a pool of entries that included books published by major publishing houses, including Viking Press, HarperCollins and Knopf. All eight of MIller's books have been self-published through Silver Print Press, his own small publishing house in what he likes to call Colbyville. The quality of those books, in both content and design, set Miller apart in the field of self-publishing. "I've always done it the way a lot of people are doing now," he says, referencing Kickstarter campaigns and other fundraising avenues. "Basically just cutting out the middle man." While NES' stated goal is to aid New Englanders in New York, Miller says he was told that another goal of the organization is to give New England authors exposure in New York. "Which would be good!" Miller says. "It's hard to sell out of state. People don't take Vermonters very seriously for some reason." This is not his first honor. Miller was named Vermonter of the Year in 2006, and has racked up a number of awards for his seven previous books of photography. Miller lived in New York City in the 1950s and '60s, working as reporter and photographer for LIFE magazine in its heyday. He left that "very good job" to come and raise his kids in Vermont — and to "ski and hunt, and ski and hunt, and ski and hunt," as he puts it. But Miller has no regrets. "It's beautiful here, you're surrounded by a lot of beauty," he says. "So I was always happy. I was always broke, but it didn't matter." Miller prefers to photograph a "vanishing species" of Vermonter, the salt-of-the-earth types who practice and believe in self-reliance and stay away from busy roads. Gentrification, for Miller, is a personal affront: "These days, creative people in Vermont are living on air," he says. But newcomers and young people working in agriculture are also featured in A Lifetime of Vermont People, including Pete Johnson of Pete's Greens in Craftsbury, and Shaun Hill of the Hill Farmstead Brewery in Glover. An exhibit of the portraits featured in the book is halfway through a yearlong tour of libraries across the state, organized by Frog Hollow State Craft Center in Burlington. The show is currently at the St. Johnsbury Athenaeum, and will travel to Derby Line and Barre later this year. In the meantime, Miller says he's looking forward to going with a friend to New York for the NES awards reception in April. "I'll say a few words to thank them," he says. "And I hope it'll be at least a little warm."